Since I was accepted to vend at Pantheacon next year (see the Events page) I’ve been trying to up my productivity. Sometimes, though, the dayjob just takes too much out of me. So, first I grabbed one of the precut chunks of paper from when I ordered a custom-cut carton a while back. Cartons hold 1,000 parent sheets, so that’s how many are in that stack. 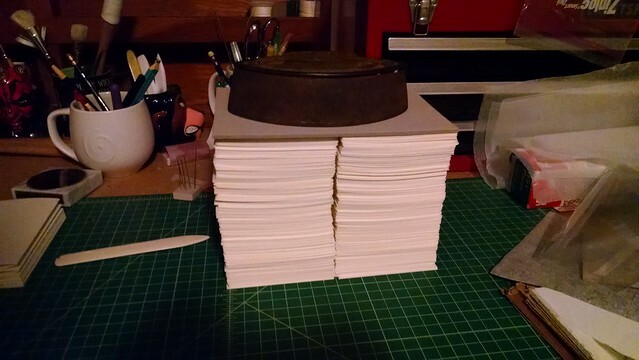 The paper is too long, however, so I used my guillotine to cut it into two stacks of 5″x8″ sheets (bringing the total to 2,000 sheets). After that, I started separating the pile into groups of four and folding them in half. You can see a small stack of already-folded signatures under that cast iron iron (yes, it literally used to be used to iron clothes. I have no idea how old it is, but it weighs a ton and that’s what I was looking for). 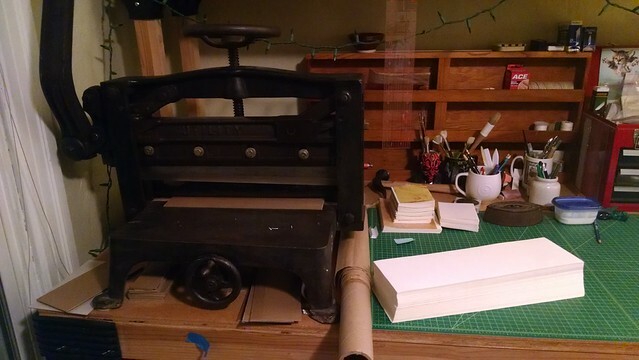 Basically, I’d fold batches of four until I ran out, then take those signatures, stack them, put them under the iron, and divvy up another batch of sheets. Lather, rinse, repeat. In the end, I had 25 books worth of signatures (2,000 sheets into groups of four = 250 signatures, ten signatures per book makes that = 25 books). 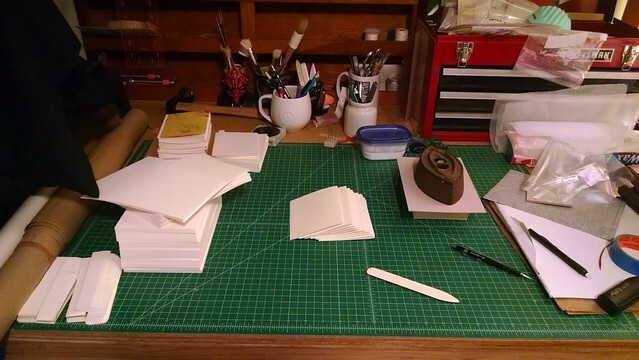 Next up: endpapers and punching sewing holes! This entry was posted in Binding Process. Bookmark the permalink.